SANTA BARBARA OIL SPILL MAY 2015 - MetaModern Magazine, The Voice of Our Digital Meta Modern Culture. May 2015 on the west coast of the USA was defined by the Santa Barbara oil spill. Not having a major spill since 1969, it makes a person wonder. Santa Barbara is a city filled with life, energy and innovation. When water appeared scarce, this city rose and built a desalinization plant. When they had a problem with the homeless, they bussed. When they realized they were an extreme tourista destination, they enlarged the freeway. This is a city of action, a city on its toes for the people and for the good of its people. Sun, fun and education riddle this community. Now they are faced with a situation that the locals are saying, “I told you so”. On Friday, environmentalists declared the spill “a wake-up call” on continued oil development. They urged state and federal politicians to refuse additional oil projects, especially in Santa Barbara County, and called upon the nation to usher in a “post-oil era” by embracing renewable energy. Decades ago the locals said, no to oil derricks in their waters; for many reasons including oil spills and aesthetics. Now, the town is faced straight on with their worst nightmare. They have faced fires, water shortages and earthquakes, all of which were mother nature’s and mother nature and man’s results. Now, faced with purely man’s deliberate need for energy, Santa Barbara must accept this disaster, this quandary of need and greed and face facts and respond with immediacy. This oil spill could not have happened in a worse place with a more active community. If the progressive Santa Barbara had only known, anticipated, prepared certainly they would have had their solution precisely in place. Truth is, there is nothing in place but old fashioned chemical clean-up and personnel wiping, swiping and nurturing the animals, land and ocean. 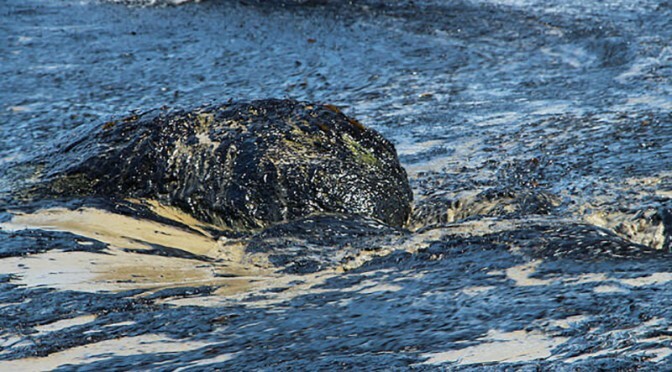 If any county and city to rally to end, suppress and fix such modern disasters, it’s the metamodern government of Santa Barbara, for they would be the group to implement cleaning up oil spills with magnets. cleaning up oil spills via MIT.